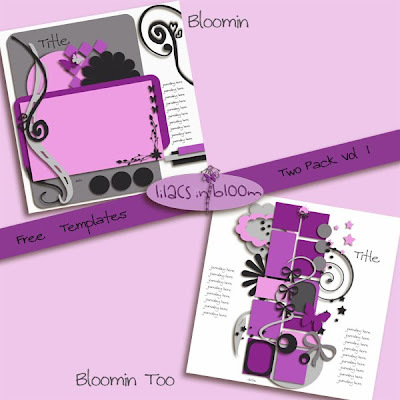 Lilacs In Bloom: Two New Free Templates for you!!!!! I am so super excited to share with you my Bloomin template two pack freebie today! Included are two templates, Bloomin and Bloomin Too! Bloomin was inspired by a combination of pages and Bloomin Two was inspired by my dear creative friend Carly!! I hope you enjoy scrapping with them! Please stay tuned for more freebies! Love it sweetie. They are so darn beautiful!!! Love it!!! So darn beautiful Gina. You are amazing. Gorgeous Gina!! Love them! Thank you gobs! Thanks hunnie these are GREAT!!!! Thank you so much for this post. I want to let you know that I posted a link to your blog in CBH Digital Scrapbooking Freebies, under the Page 6 post on Aug. 16, 2010. Thanks again. Beautiful!! Thank you so much, Gina!